Have you got any knock knock jokes that are better than that one? Surely not! Colin and Pauline have been absent from this weeks comics. Did you notice? They’ve been on holiday that’s why. I’ve put some of their holiday photos in the blog section. Those crazy cut-ups! Very adorable! No I’m not, you’re a poo! <3 You're comic's are constantly adorable, and I love it! I AM A TIME LORD! AWWWWW nephew/nieces are the best! Gasp! You mean you don’t believe insanity clause? you’re serious? you never heard of me?!?! YOU JUST GOT NIKKY NINE DOORED! now here’s a thought: with the invention of the doorbell, why haven’t we evolved to telling ding dong jokes? can i interest you in buying a doorbell? you want to tell dong jokes? They are so cute. >< Aw..
That’s the best knock knock I’ve heard in days! Duane the tub, I’, drowning! M.A.B. It’s a big horse. M.A.B. It’s a big horse who? M.A.B. It’s a big horse I’m a londoner. Don Giovanni ice cream today. Aww someone beat me to the “orange you glad?” one! Oh well… I don’t know too many knock-knocks, but I wanted to say that this is one of the cutest MCL comics I’ve seen yet–I used to do stuff like this when I was a kid all the time! My cousin and I made our relatives sit and watch us act like hams just like this. Good memories! Abe C D E F G H… ! the starfish one is my favourite ever. except when i tell it i make a stick my hand (fingers spread out like a starfish) onto the other person’s face while making a suction sound. the starfish one is my favourite ever. except when i tell it i stick my hand (fingers spread out like a starfish) onto the other person’s face while making a suction sound. Isabelle broken? I had to Knock! I like the 5th thing-maging. ….wat should i put next?? 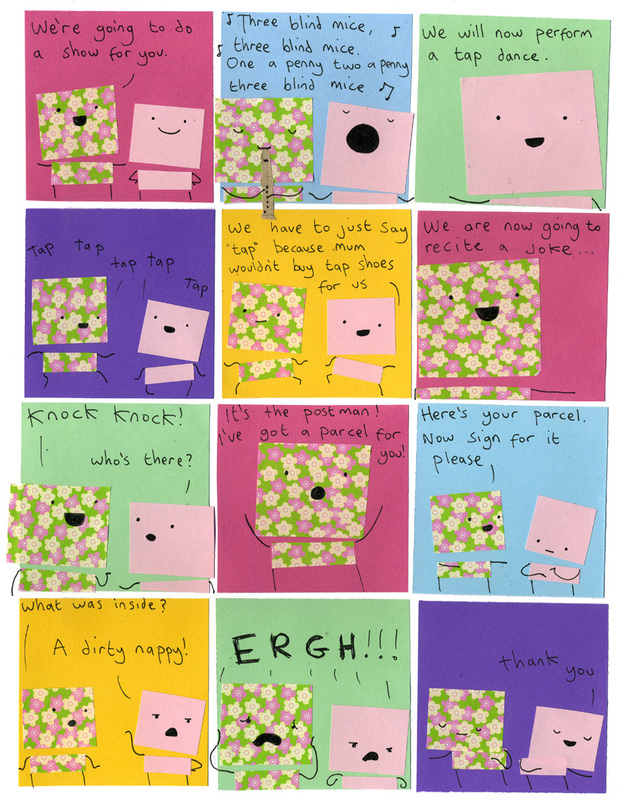 And that is the cutest comic I have seen in ages. It’s a few weeks late, but I can’t resist…. get me a double coffee who? Colin, GET ME A DOUBLE COFFEE NOW! And stop fooling around! mango’s wee wee on the front lawn! Police stop telling these terrible knock knock jokes! What are the 4 letters that scare a robber most? Wooden shoe come and stay for a cup of tea?